Naturally infused with Rosemary our Cotswold Gold infusions are available in 3 sizes. Our Rosemary infusion adds a garden fresh taste to meat and vegetables. 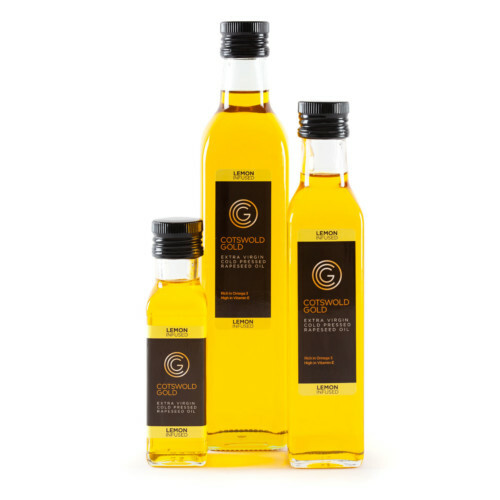 Cotswold Gold Rapeseed Oil Infusions – Rosemary an irresistible, garden fresh flavour that is great with meat and vegetables. Our Rosemary infusion can be used in a variety of ways. We hope you enjoy! A Mediterranean plant rosemary has a minty, sage-like, peppery, balsamic taste, therefore adds depth of flavour to meats such as lamb and chicken. Delicious drizzled over pasta, new potatoes and pizza. Makes a delightful dipping oil for crusty bread. Perfect for roasted vegetables, soups and stews. Pairs extremely well with other herbs such as chives, dill, oregano, basil and thyme. Makes the ideal Sunday roast addition!